In Shimo-Kitazawa, make sure you stop by FLASH DISC RANCH, a really good records shop in Tokyo. The master of place is Masao Tsubaki opened up in December 1982 (waouh !) and is still the one behind the counter counseling youngsters about what to buy and DJing some good R&B, soul, jazz, etc. tracks. As he announces himself, his specialty is “cheapies”. And rightly so, the price of the products sold in his shop are very affordable for any budgets, even very limited ones. 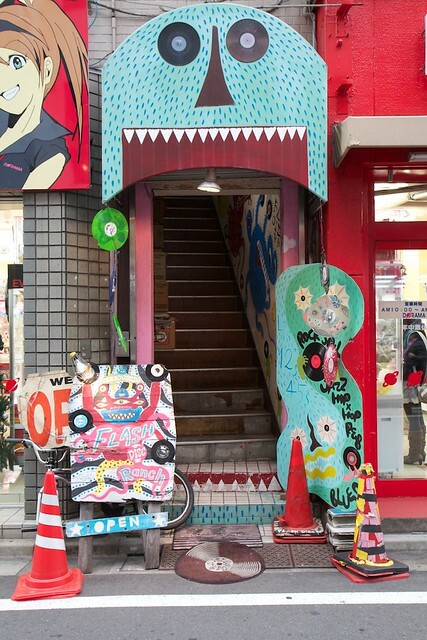 Masao likes to describe his work as an “incubator for young people”, which is why he tries to keep prices down. The result is that Flash Ranch is seen by many as a “family” or people who started digging and collecting records here (some of them years ago) and they keep on coming back. Masao speaks very good English (rare enough to be mentioned) and this is a valuable point to dig in his 15 000 records catalog (mainly vinyls). If you can, try to visit on Saturdays and Sundays, for the “special new stuff”. 1- the cleaning lotion ! Home made, efficient, very soft on vinyls, Masao sells it all over the world ! 2- the cd soft case !!! A perfect tool to store your CDs and gain space. That too Masao sells all over. Check-out the website. It’s very welldone (great design). They have the best t-shirts too (with their monster logo) - I still wear mine proudly. bought three great albums for 300yen! Definitely a fan. Also the proprietor was very helpful and offered suggestions in English.